Rockstar Energy Racing made the short trip south from Corona to the last west coast stop in San Diego, before the series heads east. They entered the race in a rare tie for first place in the 250 championship after some huge positives and some minor negatives. If it wasn't for the team's ability to constantly overcome, they wouldn't be in the title conversation. Saturday proved to have the ups and downs all mixed into one night and in the end, they left with the points lead. They continue to do what it takes to be a championship caliber program. In the final race in Anaheim one week ago, Jason Anderson had his worst finish of the season due to an unforeseen circumstance out of his control. He had to claw his way back and was fortunate enough that his effort netted him enough points to share the red plate with Cole Seely. He had no doubt however that he would be the only one running red leaving SD. As practice concluded, that's exactly what he was on track for. 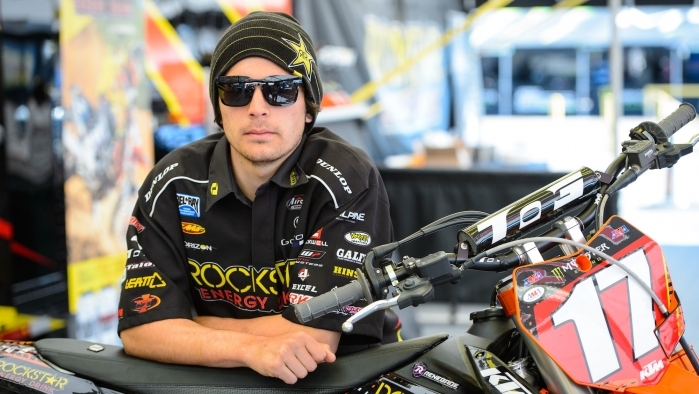 He posted the fastest qualifying lap time of the 250's and was right in the mix with the fastest 450's once again. Then along came the evening's hiccup. Just a short distance beyond the starting gate, Anderson clipped bars with another rider and went down hard. Anxiety was high as he didn't just pop right up like normal. He was a bit slow to rise and remount his KTM 250. The tension diminished as he took off and began his trek towards qualifying position. He was able to get as high as 6th place avoiding the LCQ. While it's a relief to make it into the main out of the heat, he still had a poor gate pick compared to his closet rivals. Fortunately he was able to get a very good jump and his starting position was as good as could be expected. JA went to work again, moving towards the front in nearly no time at all. This particular track was the most technical thus far in 2014, and one of the shortest. This meant lappers were really going to come into the equation almost immediately. Jason was closing in on the leader Justin Hill and had a couple close calls moving by the lapped riders. He chose wisely to back it down and settle for 2nd place as opposed to taking the chance of throwing away points and maybe even the championship. He made the right decision and heads into the break with a 4 point lead. Jason Anderson: "Weekend was good, I guess I just did damage control ya know. I had a good practice and then my qualifier was rough and I had a little digger ten feet out of the gate. Then I ended up salvaging a 2nd in the main. I could have won but I was just really nervous with points on the line. I was good until I almost hit a tuff block. Then I decided 2nd was good. " Ivan Tedesco has been doing everything he can during the week and on the weekends to improve and be a consistent top ten guy. After getting his best result of the season with a 10th at A3, he worked really hard midweek prior to San Diego. Sometimes that can be a bad thing however. An athletes body always needs time to recover when running at such a high level all the time. Sometimes, training, testing and practicing can just be overdone. That was the case for Tedesco this past weekend. He was just kind of run down and off all day. You need to be at the top of your game in Supercross, even more so on such a tough track. While Ivan struggled in practice, he did improve in the heat and semi which has been a consistent occurrence thus far this year. Nearly qualifying in the heat and qualifying easily in the semi, avoiding the LCQ. He just couldn't quite stay on his rhythm in the main however. He made his way as high as 10th, poised for his second consecutive top ten. After a few mistakes however, he settled into a pace to avoid going down and stay healthy going into Dallas. Ivan Tedesco: "Weird track this weekend. I kind of fought it all day. Didn't ride good in practice. I was a little better in the races but in the main event I just couldn't really get into a flow. I knocked it back a notch and ended up 13th. It's not where I wanna be but it's another week down. We're gonna work on it and try to be better next week." The team will now switch things up and put the west coast on hold for now. Anderson will enjoy only a couple days off, then will begin testing for outdoors. Ivan will take things a bit easier this week and allow himself to recover and be stronger on race day. Joey Savatgy is still recovering from his practice crash earlier in the year and will be replaced by fill in rider Cole Thompson. Cole has been testing on the 250 for few weeks after a couple races on the 350 in the beginning of the season. Davi Millsaps will begin riding this week and will work to return to Supercross as soon as he can.